For over 12,000 years the Lenape and their ancestors occupied northwestern New Jersey. Who were they? How did they live? What kinds of tools did they make and use? Archaeologists have been trying to answer these questions for over a century. For Archaic peoples, rock shelters, consisting of natural overangs or hillside depressions, were temporary stopovers that offered protection from the rain and snow. In winter they might have been closed in with windbreaks made from skins or brush. The native people of the Skylands region had no written history. In fact, they had no writing except for the use of pictographs, some of which were carved on stone. Much of what we do know about New Jersey's prehistory is a result of work done by archaeologists working with other scholars to reconstruct the life and culture of the Lenape and their ancestors through the systematic study of artifacts, seeds, pollen, bones, and a myriad of other clues found in the soil. Early accounts by explorers and travelers, along with journals kept by missionaries and settlers, have also provided a wealth of first-hand observations about the social customs of indigenous groups living here in the 1600s and early 1700s. 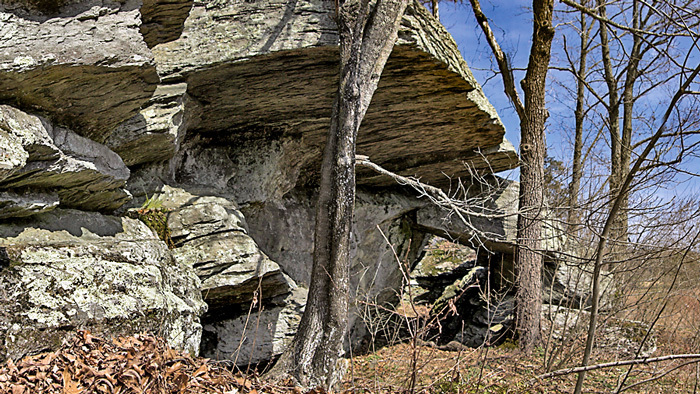 The Bevans Rock Shelter in Montague is one of several excavated in Northwest New Jersey. In the 1960s, the proposed Tocks Island reservoir project initiated salvage excavations in the Upper Delaware Valley. Today, the government protects most Indian sites, and archaeological surveys are required on public property prior to construction. 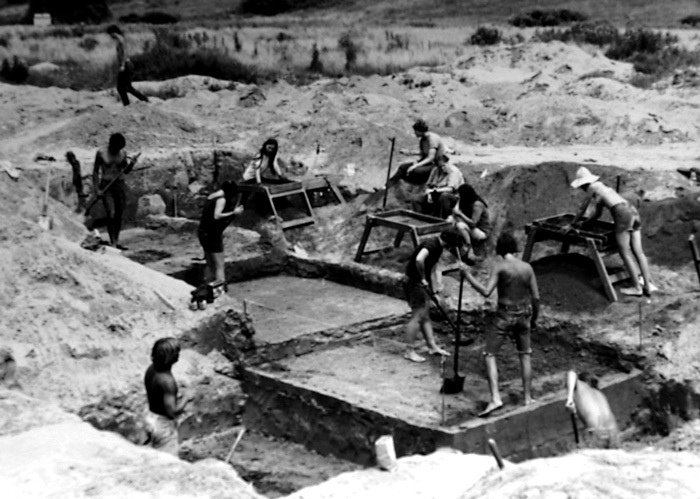 Information gathered from these projects as well as ongoing research by members of the Archaeological Society of New Jersey and others continues to add to our knowledge of the region. So what do we know? Because the prehistoric ancestors of the Lenape did not keep written records, we do not know what they called themselves. For this reason, archaeologists have created names such as Paleo-Indian, Archaic, and Woodland to identify the different prehistoric periods and cultures. 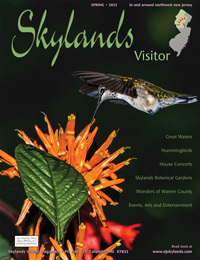 The earliest ancestors of the Lenape came to the Skylands region about twelve thousand years ago. The climate was much colder, and there were no hardwood forests; only marshlands, tundra grasses and scattered evergreen trees. Back then, cold-adapted animals such as woolly mammoth, mastodon, musk ox, caribou, and moose-elk lived here. Some of their skeletal remains have survived as in the case of the Highland Lake mastodon found near Vernon and the Bojak mastodon discovered in Liberty Township, Warren County. Paleo-Indian hunters who killed animals with thrusting spears or lances left behind skillfully made fluted spear points such as those found at the Zierdt Site in Montague and the Plenge Site located above the Musconetcong River in Warren County. Human remains of these first Americans have not survived, although their distinctive stone tools and weapons have been recovered on occasion. 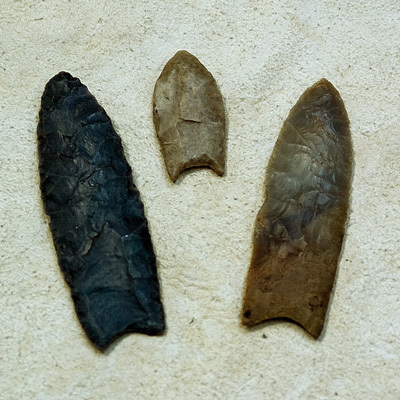 Paleo-Indian hunters left behind skillfully made fluted spear points such as those found at the Zierdt Site in Montague and the Plenge Site located above the Musconetcong River in Warren County. Their knives, scrapers, drills and engraving tools were made using the finest, carefully chosen, stone. Indeed, the workmanship seen on many Paleo-Indian artifacts has seldom been equaled by the Indian flintknappers or stone toolmakers of later times. These nomadic people followed the herds, and the seasons, through the area in small bands. Not much of their temporary encampments has been left to discover. As the climate gradually became warmer, some descendants of the Paleo-Indians stayed and adjusted to the changing conditions. In the centuries that followed, other people with different tools and weapons came into the area from the south and west. The interaction of these various groups of hunting, fishing, and gathering people as they adapted to the changing environment created what archaeologists call the Archaic era. Archaic sites have been found throughout the Skylands region, principally near major rivers like the Delaware, Raritan, Paulinskill, Pequest, Musconetcong, Walkill; and lakes like Swartswood, Culver, and Hopatcong. Other locations frequented by Archaic groups were near springs and swamp edges, rich in plant and animal resources, like the Great Meadows and the Great Swamp. On these sites, thousands of spearpoints have been found. Traps, deadfalls, snares, and bolas were other means of obtaining game. Fish were speared, caught in nets or trapped in fishweirs. Indeed, almost anything that moved—possibly even insects—was hunted and eaten. Although Archaic people gathered many kinds of vegetable foods, they did not know how to garden, and except for the dog, they had no domesticated animals. Archaic Indians probably used shelters similar to the small round or rectangular shelters found in other parts of the Northeast. And, like their predecessors, they also lived in caves and rockshelters like the Fairy Hole Shelter near Johnsonburg, the Bevans Rock Shelter in Sandyston and Moody's Rock Shelter near Newton. On Archaic sites, woodworking tools including heavy stone axes, gouges and adzes, were used to make structures, dugout canoes, wooden bowls, ladles and handles for tools and weapons. After about 4,000 BC, chestnut, oak, and hickory trees became more plentiful. An abundance of game followed, as related mast foods (like acorns and other nuts, tender branches and bark) provided additional nourishment for deer, elk, bear, raccoon, turkey. 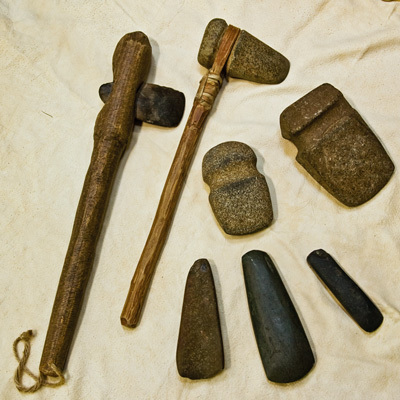 On Archaic sites of this time period, woodworking tools including heavy stone axes, gouges and adzes, were used to make structures, dugout canoes, wooden bowls, ladles and handles for tools and weapons. Hammerstones and milling stones to crack nuts or grind seeds and nutmeats also first appear during this era. Fine-grained stones like argillite and flint that abound in the Skylands region were raw material for greater diversity of smaller tools. Flint quarries or workshops, like the Black Creek Site in Vernon, produced spearpoints, knives, scrapers and other tools. It is probable that many other implements made of perishable material like wood, bone, antler and shell, have long sinced crumbled into dust. The Woodland period, a time of innovation and change, spans from about 1,000BC until the coming of the Europeans. The bow and arrow replaced the spear, and the use of clay pottery became widespread. Horticulture, or garden farming, became an important supplement to the traditional hunting, fishing, and gathering economy, Many Woodland sites were located near rich alluvial soils like the Pahaquarra, Miller Field, and Minisink sites in the upper Delaware valley, or the Dark Moon Site, in the Pequest drainage of Sussex County. The farming Indians needed to stay close to their lands, and built more enduring houses. Soils had to be tilled, seeds planted, and the growing plants tended, harvested, prepared and stored for use in the wintertime. Children and old people ate better, received more care and lived longer, and families increased in size. These self-sufficient people became the Lenape or Delaware Indians we recognize today. 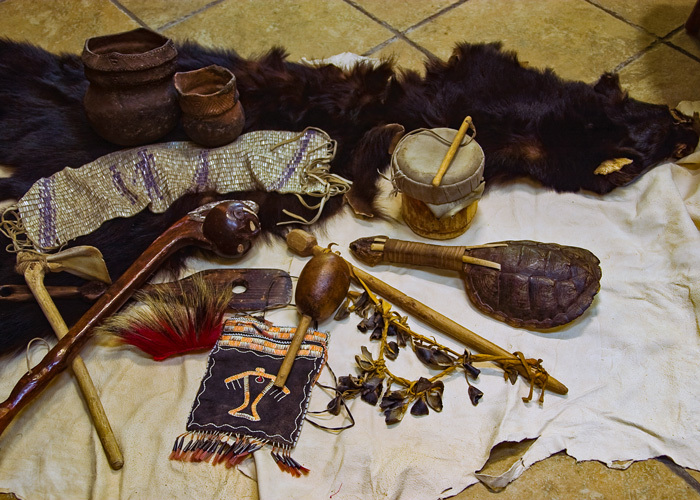 Woodland period Indians stored weapons, tools, clay cooking vessels, baskets, furs, mortar and pestles, bowls, woven cattail mats and numerous other objects (above). We now know that two related but distinct groups of Indians occupied the Skylands region. Those living in the northern half (above the Raritan River and the Delaware Water Gap) spoke a Munsee ("People From Minisink") dialect of the Eastern Algonquian Delaware language, while those communities to the south spoke an Unami ("Downriver People") dialect of the same language. The beliefs and cultures of these two groups also differed somewhat but for convenience, we will use the word "Lenape" to refer to all the Indian bands living in Northwest New Jersey. When the first Europeans arrived, the land was still densely forested and rich in wildlife. Some Lenape lived in small groups of 50 to 100 people, others in larger groups of several hundred, in villages along the banks of rivers, usually in an area with good rich soil. The Lenape hunted, fished, farmed and gathered wild plants, seeds and nuts according to the seasons. The traditional Lenape house was a wigwam, built of saplings and covered with bark or cattail mats. Several families -- all related through the female line -- could occupy larger dwellings called longhouses. Men cleared land for gardens, did the woodworking, built the houses and made canoes. They hunted, fished and traded with other groups. Women did the planting and harvesting, collected firewood, tanned animal hides and made clothes. They were responsible for gathering greens, berries and nuts, and for preparing the meals and caring for the children. There were strong ties between parents and children, who received love and attention, but were expected to do their share of the work. The early explorers and settlers who first saw the Lenape Indians described them as tall, straight, well built people with broad shoulders and strong, smooth muscles. They were sure-footed, quick and able to endure long strenuous journeys. Lenape clothing was simple. In fair weather, men wore only a breechcloth. In cold weather a fur cloak was added along with leggings and soft soled moccasins. Women and girls wore a rectangular wrap-around skirt and, in colder weather, a poncho-like top called a yoke. Beautiful, warm mantles and robes were also made from goose or turkey feathers carefully sewn to a kind of netting. Clothes may have been painted, fringed, or decorated with shell beads or porcupine quills. Ornaments were made from natural substances like stone, bone or antler, shell, or animal claws. The Lenape believed in a single powerful creator called Kishelemukong or "He who creates with his thoughts". He created all good things including the Manetuwak, the spirit helpers who lived in and controlled the forces of nature, plants and animals. Mahtantu, an evil spirit, made the tormenting insects, useless plants and put thorns on berry bushes. All things had spirits: animals, insects, trees, air, even rocks. Therefore everything had to be respected and cherished, and every Indian endeavored to live in harmony with the environment, its plants and animals. 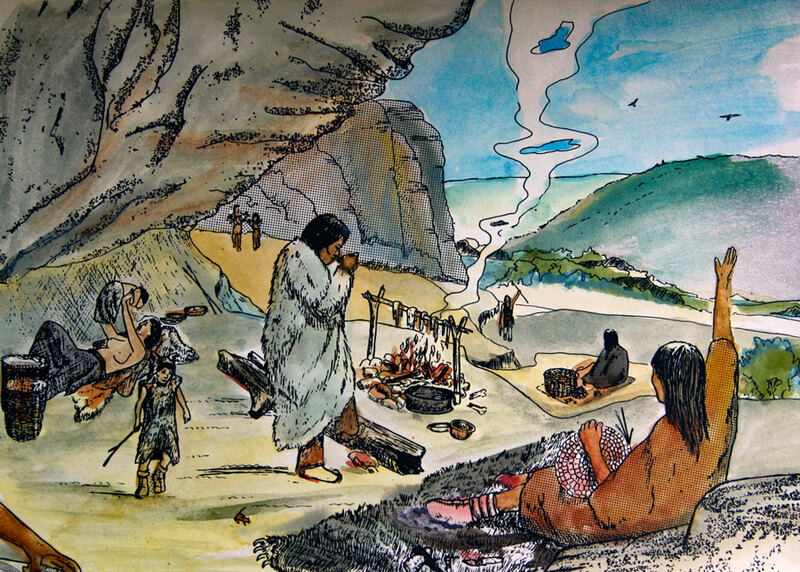 The Lenape took frequent steam baths in a "sweat lodge" to purify and cure themselves. Every family knew the medicinal value of plants to cure ordinary sickness or injuries, but for more serious problems they consulted two kinds of medical practitioners. The Nentpikes or herbalist applied natural remedies. However, the Meteinu or Medew also claimed to know how to deal with witchcraft and other occult practices. Death was a great calamity. Friends and relatives gathered, and the body was prepared for burial, dressed in new clothes and interred in a shallow grave. The souls of the good made a journey to the afterlife where Kishelemukong dwelt. The coming of the Dutch, Swedes, and English explorers, settlers and traders changed the lives of the Indians. European glass beads and bottles, iron axes, knives, adzes and hoes, brass kettles and ornaments of metal, cloth and clothing were irresistible to the Indians and were traded for pelts of bear, beaver, otter and deer. As more Europeans settled, the condition of the Indians rapidly deteriorated. Disease, war, alcohol and simple misunderstandings quickly annihilated more than half of the native people. After a little more than a century following European colonization, only a few Indians remained to work on farms or in industry. Arrowheads, stone axes, pottery and other objects left here long ago by the Lenape and their ancestors are still occasionally found in a farmer's field or along a riverbank. While holding an artifact in your hand, it is difficult to imagine who left it there or what life was like in the time we refer to as prehistoric. Only a rough sketch of a robust culture remains; we know nothing of the human deeds and dramas that occurred. An archaeologist and authority on the region's prehistory, John Kraft has over forty years of public education and museum experience and decades long invovlement with the Lenape people. An author and illustrator, his books and engaging teaching manner have proven very popular with all audiences.